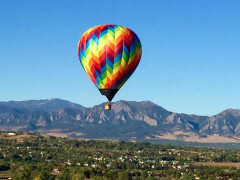 Why The Rocky Mountain Hot Air Balloon Ride? If you want that romantic, unforgettable experience, be it for a surprise birthday, anniversary gift, marriage proposal or just to impress the hell outta the one you love, it’s time to start thinking in three dimensions! 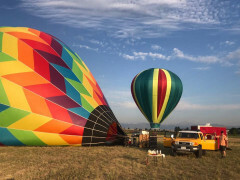 Most day trips wallow in the restrictions of two dimensions, but a Colorado Hot Air Balloon ride will take you up, up and away, soaring high above the beautiful Rocky Mountain scenery and making you forget you ever lived in a boring, ground-based, non-flying world! At Life of Riley, we understand that sometimes the occasion calls for the two of you to get away from it all. You’ll begin your day with coffee, snacks and a safety briefing as you watch the 77,000 cubic ft “Sol Dancer” inflate and stand majestic, prepared for flight. Why Is It So Amazing Up There In The Clouds? 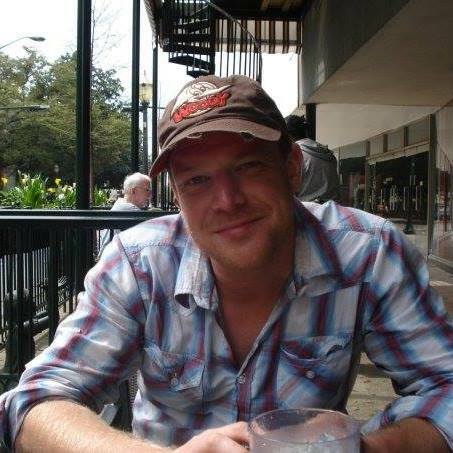 According to your preference, he’ll soar you high into the blue above The Centennial State or fly you at a more gentle attitude, hugging the contours of the landscape so you can breathe in the unimaginable colours of the Rockies in all their glory. After your pilot delivers you back into the loving arms of mother earth, you both will enjoy the “traditional champagne toast” and post-flight celebration. Sound like a date? We thought you’d like it - you know what to do; move your two-dimensional cursor over that two-dimensional link and click! Romance your sweetheart above The Rockies. See what it's like to fly like an eagle. Experience fresh, clean air and unimaginable colours of the great outdoors. Champagne toast upon arrival back on terra firma.